The dust has hardly settled from the work that Joe and his crew from Warm Solutions did today but I had to re-assemble the room anyway. I have had this party planned for a while and there was no turning back. Luckily Joe made sure everything was in on time. The unfortunate part is, I have to take everything back out after the inspection so we can plaster and sand. At this point, we can assemble and disassemble this room in 20 mintues considering we’ve done it nearly 6 times already. I’m just glad to have my living room back even if its only for a few days. The couch is from Room and Board. Its my favorite couch that I have ever owned. The bench is made by George Nelson and is sold by Herman Miller which you can find at stores like DWR and Room and Board. 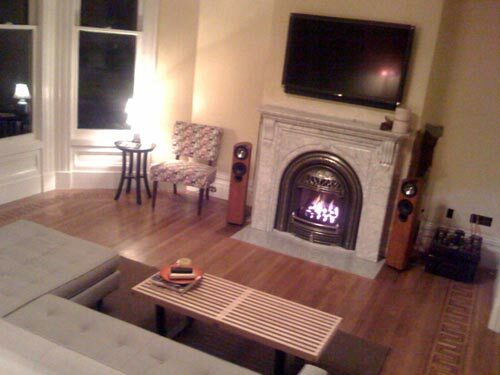 Did Warm Solutions provide both the mantel and the insert? Were you happy with their work and their prices? Any other recommendations for sources of Victorian-appropriate mantels, surrounds and inserts (I live in the Bay Area as well)? Thanks! Warm Solutions provided the hearth and the inserts. This job isnt cheap but its something that adds a great deal of value and warmth to the house. We went from no working fireplaces to three in a month. I dont have any other sources. I did at one point but we ended going up with Warm Solutions.